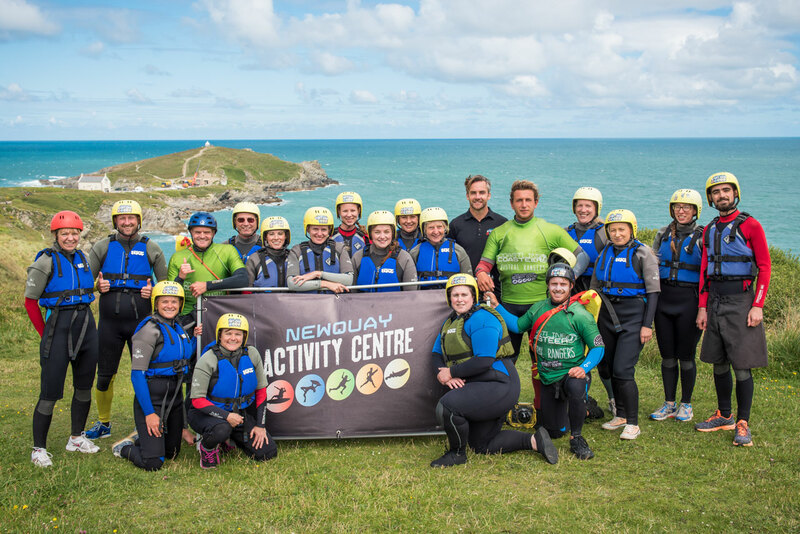 You wouldn’t normally associate an activity provider with the heritage sector, but Newquay Activity Centre has demonstrated a forward-thinking approach to recognise and work with what’s right on their doorstep, thereby enhancing participant experience and actually educating through fun as well as helping to reinforce a dimension to Newquay that exists, but is often over-looked. In November 2015, Cornwall 365 organised a Heritage guided walk of Newquay in order to challenge the traditional perceptions associated with the town. Working with 2 local historians, a number of tourism businesses attended and the aim was achieved! In addition we received some press coverage and then, excitingly, we were contacted by business, The Newquay Activity Centre. Having seen the press coverage, they contacted us to ask for help in developing one of their products to include a heritage aspect. The centre is a recognised provider of surfing and bodyboarding lessons and relies heavily on tourism. 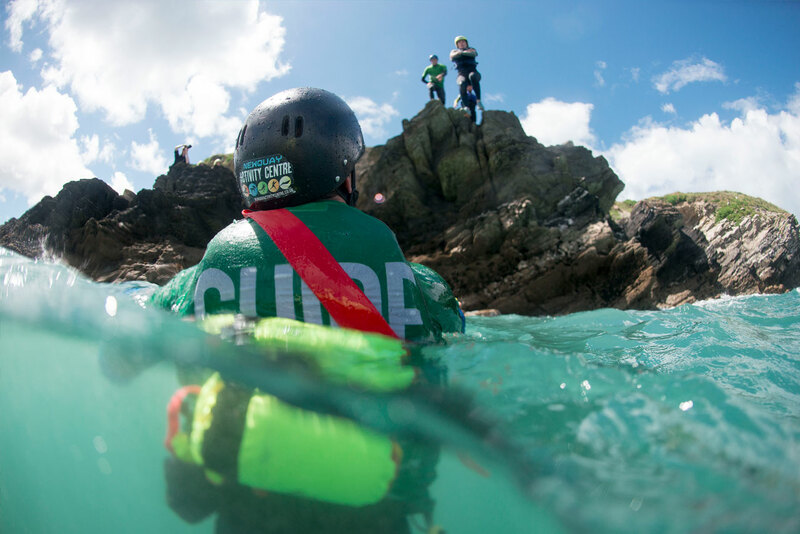 Another of their core activities is ‘Coasteering’, which is a way of exploring sections of the coastline from the sea and scrambling along cliff faces as well as jumping off craggy outcrops into the Atlantic below. With our help, they learnt about the rich history of Newquay along with some of the more fabulous tales and developed a coasteer which incorporated the heritage facts and fiction to inform their guests. 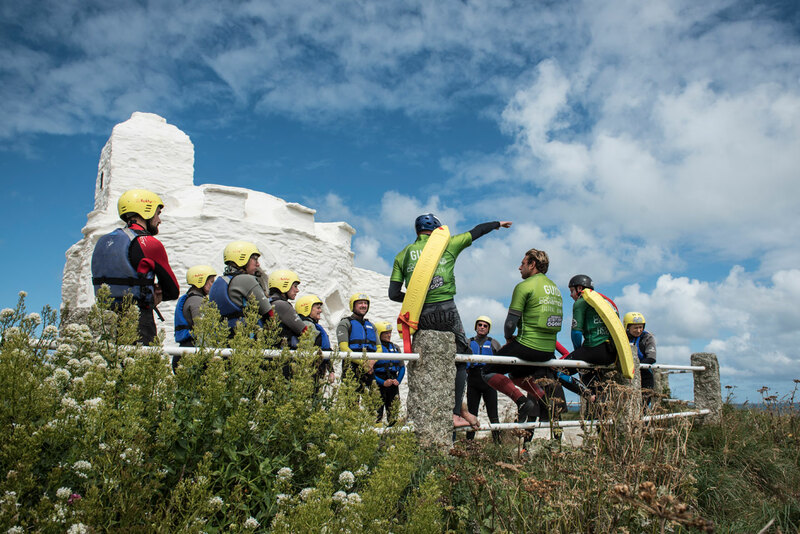 The link made between Newquay Activity Centre and Newquay Heritage Archive and Museum has been a really positive one in encouraging other museums to develop more diverse and ambitious partners, attract new audiences and reach out into their communities. This example has been shared at regional level. It was a sunny day but quite large swell – or ‘spicy’ as the instructors call it. We were all a little nervous yet excited, but from the moment we were greeted we felt we were in confident and reassuring hands. 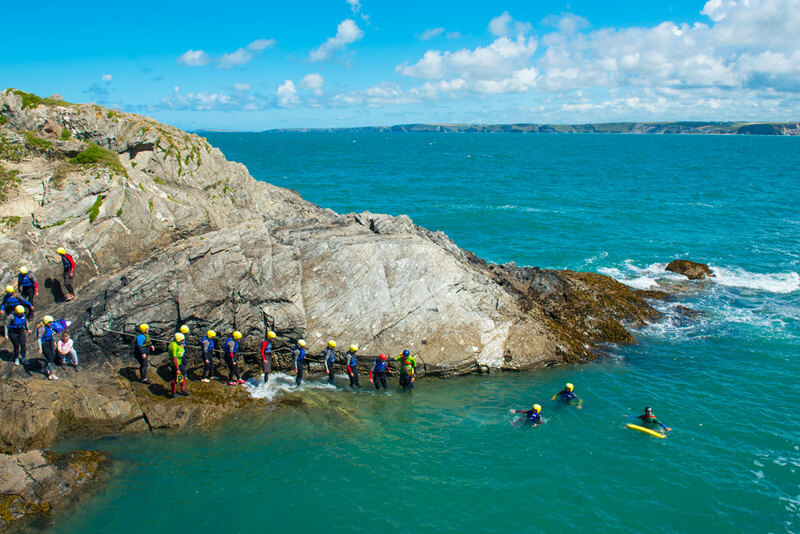 After being suited and booted, helmeted and bouyancy aided, we set off along the coast path to learn a bit about the history of Newquay and to know what we were looking at. Our instructor Johnny was full of local knowledge and was extremely interesting to listen to. It was lovely having a different perspective of the town and once in the water, it was a beautiful way to enjoy the coastline. We encountered various jumps, getting higher as we progressed and the team spirit was really encouraging to anyone faltering on the edge. The waters were emerald and blue and warm and bobbing about in the swell was great fun. 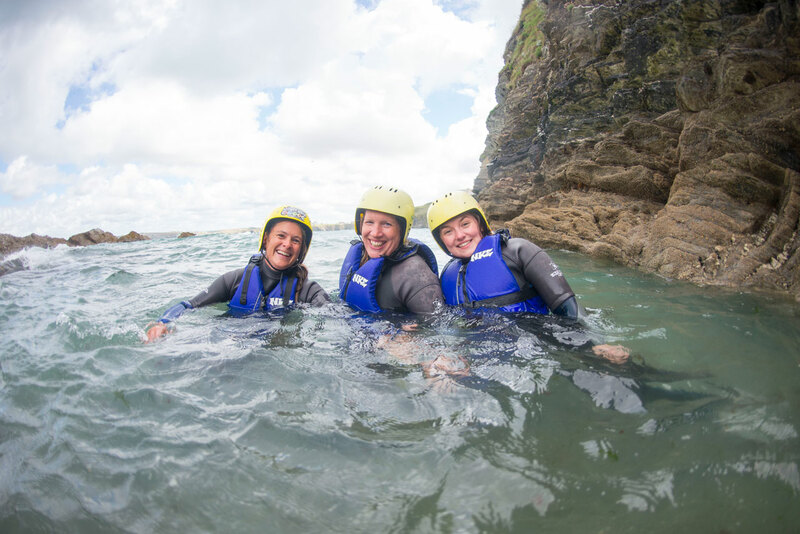 We edged along the rocky cliff face and held fast as the waves gently lifted up and down, all the time with our fantastic instructors (Johnny, Jo & Wozza) right behind us ready to lift us back up if we let go. We saw the Newquay Tea Caverns and learned about the smuggling. We heard stories from the past and true or not, they were fun to listen to. We also learnt about the local wildlife and were not allowed in certain areas due to nesting kitty wakes and resting seals. 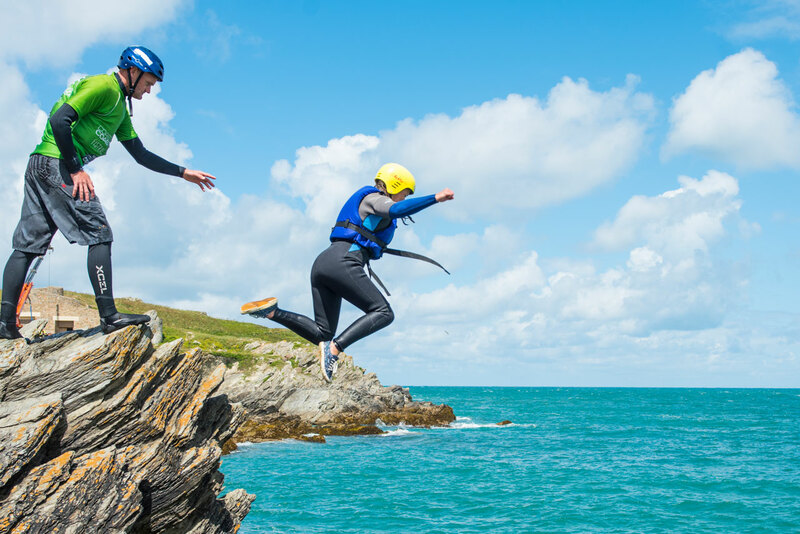 The Activity Centre works in close partnership with Cornwall Wildlife Trust to ensure they are ecologically and environmentally aware on all excursions. When we reached the end, everyone had a huge smile on their face and we all had a tremendous sense of personal achievement. On behalf of the whole group, we want to thank Rob Barber and his team for organising such a fascinating and exhilarating excursion.